One hundred years ago today, Orville Wright made his bid for the Collier Trophy. The prestigious award, presented annually for the year’s most significant contribution to the field of aeronautics, was established in 1911 by Robert J. Collier. Glenn Curtiss won the award in 1911 and 1912, and Orville wanted to make 1913 his year. The basis of Orville’s claim to the prize was his invention of an automatic stabilizer (also called automatic pilot). He had been working on the device since 1905 and received a patent for it in October 1913. He installed a working prototype in the Wright Model E Flyer, in which he made many practice flights in the fall of 1913. 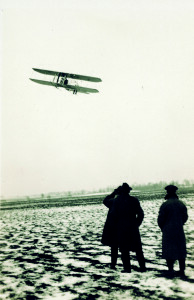 Orville made 17 demonstration flights to members of the Aero Club of America (now the National Aeronautic Association) on December 31, 1913, and captured the Collier Trophy for 1913. In his last demonstration Orville made seven successive turns with his hands completely removed from the controls of the airplane. The award was announced at a meeting of the Dayton Rotary Club on February 5, 1914. 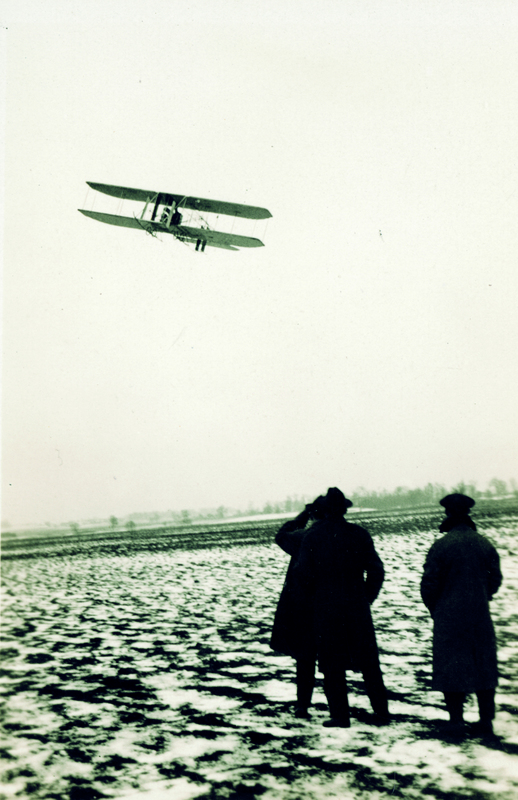 We have four photographs from Orville’s Collier Trophy demonstration flights on December 31, 1913, which you can see on CORE Scholar. The photo identifier numbers are (click link to go to photo): ms1_20_7_1, ms1_20_7_2, ms1_20_7_3, and ms1_20_5 (shown above). To learn more about the Collier Trophy and see a list of winners over the years, visit the National Aeronautic Association’s web site. This entry was posted in Aviation, Collections, Wright Brothers and tagged aviation, aviation history, MS-1, Orville Wright, Wright Brothers. Bookmark the permalink.